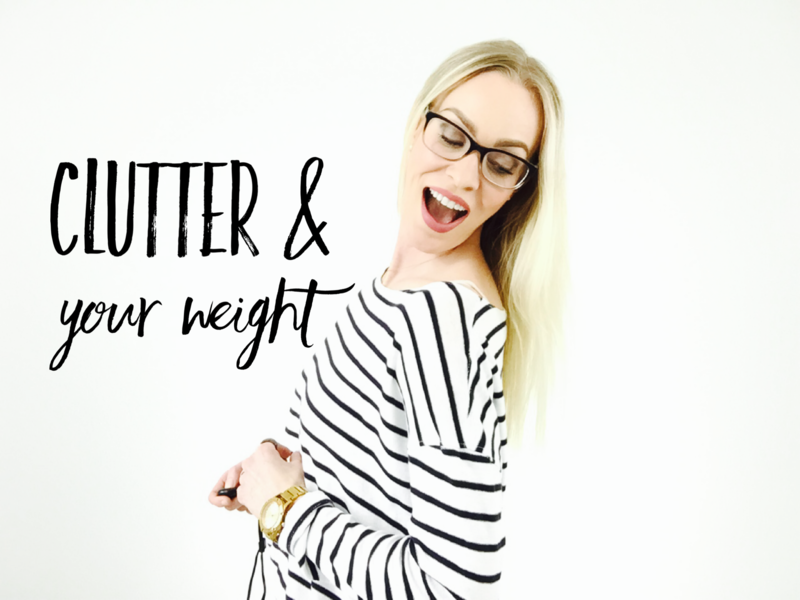 In this post, I discuss the research behind clutter and your weight! That’s right! Your junk drawer may be contributing to the junk in your trunk. To summarize the studies, we have linked cluttered spaces to overeating and binging, increase in stress hormones and abdominal fat, and the inhibition of fat burning mechanisms. To help you avoid the misfortune of the ill-effects of a cluttered environment, I provide you with my proven 5-step method (5×5 Decluttering Method) for creating a home that is peaceful, productive, and inviting. You don’t want to miss the many jewels in this post! And boy am I excited about today’s post. Today we unleash my favorite topic that not everyone links to health and wellness. I want to talk about clutter and how it impacts your weight. That’s right. Your junk drawer may be contributing to the junk in your trunk. Listen, I already know that this statement is a bit crazy but stick with me…I think you’ll find the connection to be fascinating. Many of you are familiar with my stroke scare and how it led me to make drastic changes in my health, home environment, and the pursuit of more happiness. But what you may not know is that through my difficult circumstance and hospitalization, this led to researching ways to simplify my environment and to declutter my home. The process of decluttering led to further researching ways to improve my health and the last 20 pounds slowly came off. What I did not realize until years later was that research has proven that our environment has a dramatic effect on our overall health and well-being; that a decluttered space can often become the catalyst for healthy changes in one’s life. In today’s’ post, I want to discuss specifically how a clear space can affect your waistline. Now that we know that our clutter an influence our waistline, how do we get started? Over the years I have developed my own method for clearing out my home. I have curated the best tips from top minimizing gurus and have found that this 5-Step method, using some of the best cognitive science, has helped me to clear out my entire home not once; but, three times. Of course, I stand on the shoulders of decluttering giants before me so I have to give these folks credit for inspiring the method I use and have listed my favorite gurus and their books or websites at the bottom of this post, for your review. Here is a summary of that method. CONSIDER: Ask your FIVE questions that will determine if this item fits the visualization of the lifestyle you want. With every item that you own, ask yourself four questions: “Do I love this piece?” “Is this item useful?” “When was the last time I loved/valued or used it?” “Does this item promote or inhibit my mental and emotional health?” and “What is this item’s purpose and has this item already served its purpose?” As you sort your items, the key is to focus on what you want to keep versus what you need to get rid of. If you have trouble with this, revisit your mental picture of the ideal space and the feelings you want to generate. You will only keep the items that promote these feelings. This is REALLY the only criteria.